Hart Crowser & Associates, Inc. The Federal Center South 1202 building is the result of both the 2009 American Recovery and Reinvestment Act (ARRA) and the U.S. General Services Administration's (GSA) Design Excellence program which was established to engage the United States' most innovative architects to design the nation's federal buildings. 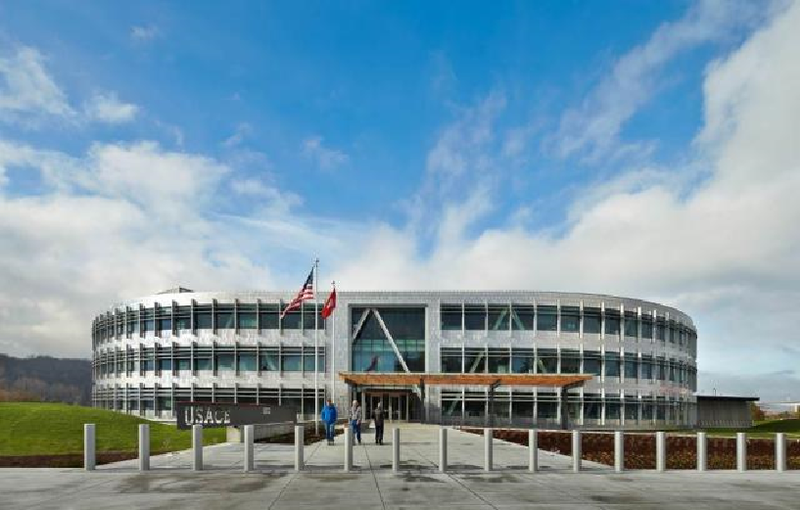 With aggressive reuse and energy-performance requirements, the new 1202 building transforms a 4.6 acre brownfield site into a highly flexible and sustainable 209,000 SF regional headquarters for the U.S. Army Corps of Engineers (USACE) Northwest District. Using a Design-Build delivery model required to get ARRA funds committed as quickly as possible, the Sellen Construction and ZGF Architects LLP team developed an integrated design and construction solution that fuses programmatic, functional, and aesthetic objectives with a new standard for high-performance, cost-effective, and sustainable workplace environments. The "oxbow" design solution provides an ideal workplace environment for the USACE, emblematic of their mission of "Building Strong." The building's form—reflecting the natural oxbows past and present in the course of the adjacent Duwamish Waterway—is functional and infinitely flexible to accommodate the USACE's nearly constantly changing team-based work. The diagrid structure extending around the building meets GSA's security requirements for progressive collapse, ensuring the building will remain standing should one of the column elements be compromised. The exterior stainless steel shingle cladding emphasizes "Building Strong" and complements the nearby historic 1930s Albert Kahn-designed 1201 building. The dramatic, daylit wood-clad atrium—the "commons"—features timber reclaimed from the former warehouse that stood on the site and serves as the social heart of the building. Sellen Construction and ZGF Architects worked to design a new LEED Gold certified headquarters for the U.S. Army Corps of Engineers that would, at a minimum, obtain an EUI of 27.6 KBtu/sf/year or less; use 100% filtered outside air; achieve a minimum Energy Star Score of 97, and obtain energy performance 30% better than ASRAE 90.1 2007. The design solution includes optimized building orientation and integrates active and passive systems, materials, and strategies that place the 1202 building within the top 1% of energy-efficient office buildings in the U.S. without sacrificing comfort, amenities, or innovative design. The 1202 building is designed in conformance with Anti-Terrorism/ Force protection standards. The building's windows and main entry are blast resistant. The perimeter diagrid design integrates sloped columns and spandrel grinders into a single structural system to provide lateral resistance and a redundant support system for floor framing. The diagrid also functions as a progressive collapse system for the structure, which meets GSA's guidelines for all new Federal Office Buildings, and means that the building will remain standing should elements become compromised. The facility is supported by 205 18-inch-diameter piles, driven at least 150 feet deep into the glacial soils. This strong foundation system is designed to support building loads and withstand the effects of seismic-induced shaking and soil liquification. Liquefaction-induced settlement around the 1202 building could range from almost nothing to nearly five feet with lateral spreading being resisted by a cut-off wall of stone columns. However, because the building is pile supported, liquefaction-induced structural settlement due to an earthquake is expected to be negligible. With the steel pipe piles providing a "free" well deep into the earth, the Design-Build team embarked on a process to verify the feasibility of incorporating a geothermal system into the project. The successful outcome is that pipes are installed in 135 of the piles that route back to the central mechanical system. The piping provides a passage for the Earth to provide enough heating/cooling water exchange to be able to eliminate one boiler and one cooler, improving energy performance. The project is one of the first in the region to combine geothermal heating and cooling with structural piles. Diagrid structure visible around the perimeter of the building. GSA's progressive sustainability requirements and high-performance benchmarks require the project to achieve a minimum of LEED Gold certification; attain an Energy Use Index (EUI) of 27.6 kBtu/SF/year; use 100 percent filtered outside air; meet an ENERGY STAR Score of 97; achieve energy performance 30 percent better than ASHRAE 90.1 2007 edition; involve 35 percent of small businesses or minority-owned companies, and pass a one year performance evaluation to guarantee energy targets were met. Current energy models predict the building to use 20.3 kBtu/SF/year, which is 40 percent better than ASHRAE 90.1 2007. The 1202 building will earn an ENERGY STAR Score of 100 and complies with the 2030 Challenge goals. The project is one of nine across the country being recognized by GSA for exemplifying the agency's commitment to promote sustainability, help communities, and advance a clean energy economy. Building section showing sustainable and integrated strategies. Organized around the work of the USACE, the open and flexible "oxbow" building form is part of an integrated strategy to provide a completely unified and flexible footprint while creating a collective identity for all departments and the 700 employees who occupy the building. The design provides the greatest flexibility for the space to adapt as work needs change. Open-plan workstations surround the central "commons" which forms the social heart of the building and houses all shared resources, including conference rooms, kitchenettes, the library, and informal seating areas to encourage interaction and create a sense of community. The design accelerates interaction and collaboration that supports the work of the USACE, while the footprint enables flexibility for infinite subdivisions of program and work groups now and well into the future. Atrium bridges and stairs clad in reclaimed timber decking connect people throughout the building and are adjacent to informal seating and "touch-down" work surfaces to encourage impromptu collaboration. Lobby graphic reflecting USACE mission of "Building Strong". GSA's request for the most flexible workplace environment drove the design solution. The U-shaped design inspired by the oxbows originally formed in the Duwamish River as it coursed towards Elliott Bay and the Puget Sound, and the building's orientation toward the water, celebrates the U.S. Army Corps of Engineer's (USACE) agency focus. Central commons bathed in natural daylight flanked by open-plan workstations located along the perimeter. The exposed "diagrid" structure and mechanical systems add to the industrial aesthetic and exemplify the identity and mission of the USACE of "Building Strong." The diagonal forms on the west-facing ends of the building promote this structural theme in a dynamic formal statement along the river's edge. External shading elements contribute detail and precision to the appearance, speaking to the importance of the intelligent interface between the occupants and the natural environment. After identifying stainless steel as the preferred exterior material for the project, the Design-Build team determined that a shingle application would best meet the project's aesthetic, performance, and budget requirements. The pewter finish varies the light reflected from shingle to shingle and gives the building the impression of being covered by fish scales, a reference to the location's maritime history. Vertical and horizontal sun-shading elements add an additional layer of texture to the façade and provide a relatable human scale to the overall building. The building was constructed for $270/SF—a significant value for the high-performance environment, considering that typical new construction of office buildings in the Pacific Northwest cost $450/SF. The project requirement to create a building with a 50-year minimum lifespan, and mechanical equipment that lasts a minimum of 20 years permeated the design process. Because GSA is a long-term property owner, evaluation of payback incorporated a longer timeline than a conventional office building, which allowed the design to include a broader range of systems. The Design-Build team took GSA's challenge to create a high-performance building very seriously, and coupled that with the USACE mission of "Building Strong" when evaluating all building systems and materials. This focus created a building that will outperform its contemporaries in terms of its energy use, durability, and ease of maintenance. The campus development for the new Federal Center South 1202 Building preserves the historic Albert Kahn-designed Ford Motor Company Assembly Plant (Building 1201) completed in 1932, and located immediately to the east of the new building. The history of the site dates back to the 1930s and Ford's "famous assembly line," which produced the "new V-8 cars". In 1940, Ford released the site to the U.S. Army who remained at the location until 1956. From 1957 to 1970, the Boeing Airplane Company Missile Production Center was located in the 1201 building. With the complex returning to the U.S. Government in 1973, the original Ford Factory and former 1202 warehouse were converted from industrial to office use. The new 1202 building and campus modernization honors the industrial past of the site, and prepares the complex to move the U.S. Army Corps of Engineers into its next generation of work. The project is a highlight of the economic activity and long-term infrastructure enhancement made possible by 2009 American Recovery and Reinvestment Act funding. Biophilia—the idea that a physical, psychological, and social connection with nature leads to happier and more productive employees—was instrumental in the design strategy. A motivating concept in the design was to leverage the building's form to provide views to the outdoors from virtually any place within the building, thereby creating a workplace where employees would be excited and proud to come to work. The building's narrow, 60 foot floor plate optimizes daylight penetration, reducing the need for artificial light and associated energy costs. Daylight will reach virtually all workstations. Low workstation partitions with noise-absorbing panels help to maximize daylight effectiveness, while affording easy work-group reconfiguration. The atrium, a natural form as it winds in an oxbow shape, will experience a variety of changing light experiences as the sun moves across the sky. The team studied the heat gain and glare associated with the glass roof. It responded with a changing degree of frit depending upon exposure and angle, though the intended result was always to let the space exhibit the variability of the sky's light—even as the predominant condition might be overcast. In the central Commons, connecting bridges offer views to nature, including the restored wetlands, the Duwamish Waterway, Kellogg Island, and West Seattle. The Commons is constructed of 200,000 board feet of salvaged timber, adding another warm, natural element to the site. To promote a relaxed, tension-free environment, an early design consideration assessed cascading naturally captured rooftop rainwater throughout the atrium. The idea evolved into "source stone" water features arranged throughout the atrium, representing the tributaries of the Duwamish. The source stones re-circulate filtered rainwater during rainfall. The design team originally considered natural ventilation to save energy in Seattle's mild climate, and promote occupants' connection to the outdoors. Ultimately, this did not work because of federal security requirements and air quality concerns stemming from the proximity of a cement plant and other industrial neighbors. Instead, 100 percent MERV 15 filtered outside air flows into offices via under-floor plenums. Heat exchangers at the top of the roof filter and temper the incoming air from the exhaust air that rises naturally through the atrium, literally making the atrium a return air duct for the building. As a leader in sustainability, GSA provided Minimum Performance Criteria (MPC) for energy-efficiency in line with the ARRA objective of upgrading GSA's portfolio of buildings to optimize performance. This project achieves an innovative approach to exceeding the MPCs through the equitable and integrated building systems design. As such, a "passivhaus" approach was the first step to reduce energy loads as the foundation for a building that requires little energy for space heating or cooling. As part of the integrated process, a base building model was developed to explore façade options and a number of technological opportunities. It was concluded that appropriate orientation, a thoughtful façade, and a passive hydronic HVAC system, offered the right balance between passive design and a more active system to handle peak conditions. This approach enabled a robust base building that maintains occupant comfort and is adaptable to programmatic changes without significant impact to energy performance. GSA used a Design-Build procurement to expedite delivery and meet ARRA deadlines. Design-Build is an integrated delivery method that allows the owner to hire a single entity responsible for the entire project—from preliminary design through owner move-in—as opposed to hiring multiple contractors, designers and engineers. The Design-Build team partnered with key subcontractors in a highly competitive design and budget exercise. Under the highly-integrated process, the team was able to program, plan, and design the project in under 18 weeks in order to guarantee a performance-based contract that met GSA's construction budget, energy performance goals, and an aggressive design and construction schedule starting with a design competition at the beginning of 2010 and resulting in a completed building before the end of 2012. The selection process began with an eight-week design competition wherein all team members worked proactively to find the best-value solution. This resulted in a proposal to GSA that based design decisions upon finding a balance between performance attributes and cost. The team guaranteed GSA a project that fulfilled its expectations for program, budget, and schedule while working in a highly collaborative manner. After project award, additional subcontractors integrated into the team, bringing their specialized expertise to the design, resulting in the verification of the cost model and further improvement of the building's performance. The heightened level of team integration allowed for new knowledge-sharing models during the accelerated Design-Build competition and a total delivery time of two and a half years. The building is required to pass a one-year performance evaluation to guarantee energy targets are met, resulting in an incentive payment of 0.5 percent of the original contact value to the team for meeting the goals. Overall, construction of the project began in July of 2010 and was completed on time, 14 months later, in September of 2012. Preconstruction efforts led to a highly integrated design process that leveraged the expertise of more than a dozen design and engineering disciplines. This resulted in a unique cost-effective floor plate and building solutions. It also allowed the team to develop a strategy for Federal Center South Building 1202 to become one of the most aggressively sustainable office buildings of its time, within the project scope and budget. Atrium "commons" and interior landscaping. The existing on-site warehouse was used to build a finished mock-up of the new 1202 building, allowing field workers to refine their approach and increase their productivity in a convenient location directly adjacent to the new building. The large warehouse also provided a staging area that shifted the burden away from the new building and allowed for a portion of the new project's exterior to be prefabricated on site, saving time and money. In addition, the team built a 12,000 SF mock-up of the "composite timber/ concrete beam system" in the warehouse to test its structural integrity, air infiltration, and proposed light fixtures. The composite beam design is believed to be the first constructed in the United States. The radiant wave "chilled sail," developed specifically for this project, was shipped from the manufacturer's facility in Connecticut and tested by the design-build team to ensure that it would perform as expected alongside the building's many other sustainable features. The early integration of the general contractor, architect, engineering, and all sub-contracting parties also made it possible for the team to work together to quickly detect and resolve potential challenges. The team used 3D Building Information Modeling (BIM) as one of the tools to identify issues and resolve them. This model was used for drawing development, clash detection, and design decisions. It was also shown on a large screen during all design meetings, allowing for real-time corrections and coordination. Because the building features a very sophisticated mechanical system, each beam penetration was modeled before it was detailed. This was especially important because all systems were exposed in the building's design, so no field modifications could be made. Once construction work began, the model served as a common tool that field trades used for communication and issue resolution. More than 97 percent of project construction waste was recycled or salvaged. As part of the team's unique recycling program, the Sellen team reclaimed 178,893 board feet of salvageable structural timber from an adjacent decommissioned warehouse. It was milled and reused as framing and decking within the building's central 'commons area' as well as to clad interior walls and act as formwork for concrete site walls. The project team worked collaboratively with the facilities personnel on training and operations helping to ensure all of the building systems operated at optimal performance at the time of turnover. After the building became occupied, the interdisciplinary team continued to work with the building operators to resolve any issues that arose in a timely manner. Their involvement ensures all systems continue to function as desired for occupant comfort and energy efficiency and has helped the building operator identify new opportunities to improve the performance of the buildings systems. Prior to occupancy, the design-build team also developed educational programming for the U. S. Army Corps of Engineers. The trainings provided occupants with a complete understanding of the sustainable features in the building, the interrelations among systems, and the necessity of engaging the users to achieve energy efficiency goals. The training also highlighted the link between sustainable building features and employees' enjoyment of the workplace environment. The competition and design-build contract requires that the project actually perform at its energy performance as modeled. The design team recognized that the actual consumption was dependent to a large degree on the appropriate use and operation of the building. A plug load study was conducted post-competition of the current U.S. Army Corps of Engineers headquarters building to better understand how the future tenants work and use equipment. Operational assumptions were then developed and built into the energy model to allow the energy target to be measured and analyzed during the first year of occupancy. Tenant plug load assumptions are also informing the current design of manual building receptacle controls and modes of operation which will be programmed for specific times of day and year. Federal Center South Building 1202 is the Northwest District headquarters for the U.S. Army Corps of Engineers. The formal measurement and verification process will update the energy model's assumptions to reflect the actual operation. This process includes notification of varia-tions, engineering analysis that indicates the resulting energy impacts, and adoption of revised energy targets that correlate to an updated and accurate operation profile. Meters and sub-meters are an important part of this strategy for energy target management. Very specific roles and responsibilities for the design team, building owner, and tenant are being established to ensure optimal operation of the new workplace. The goal is to create a shared responsibility and accountability for EUI targets. The design and construction team is responsible for building systems energy consumption and adaptability to minor tenant variations. The owner and tenant are responsible for providing information about the anticipated and actual operation of the building and equipment fit out. Additionally, all are working together to identify and implement manageable behavioral shifts for the users that will result in lower energy consumption. The design-build team has 0.5% of the original contract value at risk pending verification of the building's energy performance after one year of occupancy. This risk is shared between design-builder/contractor, architect, major subcontractors, and design consultants who have primary responsibility for the building's energy performance. At the end of the first year verification period, any remaining construction contingency will be shared between the construction and the design team. Built Ecology, a subsidiary of WSP Flack + Kurtz performed extensive CFD and energy modeling in the design stage. The internal sustainability team at ZGF used Ecotect, Radiance, eQUEST, and COMFEN, as well as proprietary software to optimize building orientation, maximize solar efficiency, and plan shading. The exposed "diagrid" structure and mechanical systems add to the industrial aesthetic and exemplify the identity and mission of the USACE of "Building Strong." In addition to providing structural durability and safety, the efficiency of the diagrid structure allowed for a 15 to 20 percent savings of structural steel material around the perimeter of the building. The diagrid was also designed to be easily erected by using bolted connections for the majority of the joints, thereby saving time and labor costs. Energy and water introduced into the building are leveraged to their highest possible use. Conditioned air is delivered to the workspace via air handling units and exhausted passively through the atrium to high-efficiency heat recovery systems. Available daylight, controlled for glare and unwanted heat gain, is directed to the office floor plates from two sides, offsetting the maximum possible amount of electric lighting. Supplemental cooling is delivered via an energy-efficient system of passive 'chilled sails' suspended from the ceiling and supplied with cool water. The project team identified a highly efficient chilled sail system as a balanced solution that would provide 100 percent fresh air, passively modulated to maintain thermal comfort, and provide low-energy cooling even in peak conditions. By enhancing the lighting controls and exploring various strategies for the mechanical systems, the building further optimizes its energy performance. An integrated use of daylighting and enhanced lighting controls that are linked to daylighting help reduce the building's energy use for lighting. Building energy use is predicted to be 20.3 kBtu/SF per year - 40 percent lower energy cost and CO2 emissions than in an ASHRAE standard building. At a cost of $270 per square foot, the Federal Center South Building 1202 delivers value. The energy bill should be approximately $200,000 a year less than comparable new office buildings. Gas 10% of heating energy. Peak cooling: 156 tons over the building area of 188,587 sq. ft. The team originally considered natural ventilation to save energy in Seattle's mild climate, and promote occupants' connection to the outdoors. Ultimately, this was not possible due to federal security requirements and air quality concerns stemming from the proximity of a cement plant and other industrial neighbors. Instead, 100 percent MERV 15 filtered outside air flows into offices via under-floor plenums. Heat exchangers at the top of the roof filter and temper the incoming air from the exhaust air that rises naturally through the atrium.